Portland, Oregon's loss is Washington Heights' gain with this pie maker that treats its oven like a newborn babe. Seconds from the oven, the pizza takes its spot on the chrome tray stand, its surface radiating heat. The crust is puffy and charred in all the right places and blanketed in basil-walnut pesto and yellow squash. Summer is packed in every bite. The Pesto Plateau was a recent seasonal creation at Wy’east Pizza, which opened in May 2016, to an almost immediate line out the door. Owners James Durawa and Ann Brock are seasoned entrepreneurs – they ran a cult-followed pizza camper in Portland, Oregon, before returning to Wisconsin and the worn-out building they transformed into a warm, welcoming, 28-seat venue whose menu revolves around pizza. But there’s also more to the menu, which the couple has rolled out very gradually, as they felt confident of their greatness. The Wy’easters serve roughly a dozen “prebuilt” 14-inch pies ($14-$22). By later in 2016, Durawa had debuted his wonderful, chewy sourdough focaccia, served with rotating dipping sauces, along with a few salads like the grated beet with “house-crisped” shallots. Diners order and pay at the counter, then grab their number and a seat in the small, bright room decorated with reminders of Oregon’s Mount Hood (known by its tribal name, “Wy’east”). Durawa took time getting to know his Forno Bravo oven before giving the public a taste. Judging from pizzas I devoured, Durawa is finding his rhythm: The Cape Blanco starts with an olive oil, mozzarella-ricotta base, then meets fresh garlic and sausage. Another boldly flavored winner, the Hot Marmot, has pepperoni, garlic and sweet-hot Peppadew peppers. 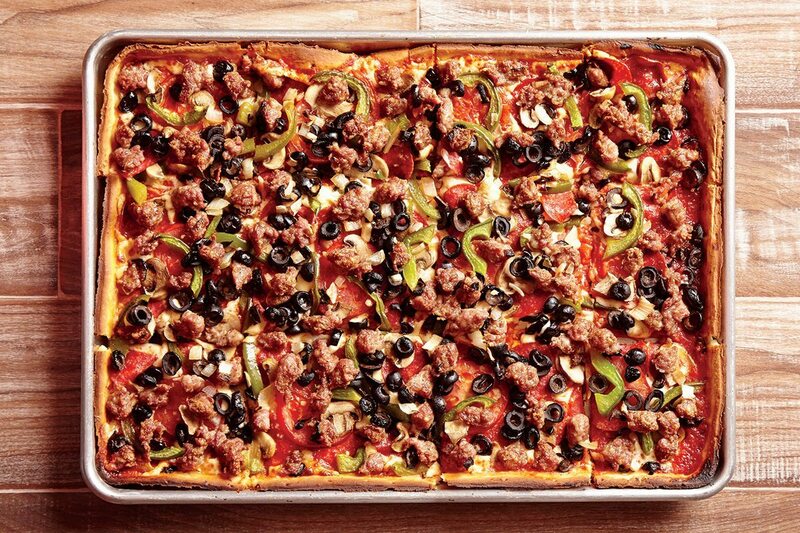 With sweet Italian sausage and abundant red onion, the Hogsback is a meat-lover’s pie. And we mustn’t forget that seasonal special, spotlighting vegetables, herbs and cheeses from local purveyors. 5601 W. Vliet St., 414-943-3278.